Linz 2009 European Capital of Culture - The Business Plan. Linz 2009 European Capital of Culture OrganisationsGmbH had a basic funding of 61.5 million euro, a sum that was stipulated by contract and covered the entire timespan of the project from 2005 to 2010. Linz09’s official sponsors were the City of Linz, the Province of Upper Austria, the Federal Republic of Austria (Federal Ministry of Education, Arts and Culture), each of whom contributed 20 million euros, and the European Union (1.5 million euro). 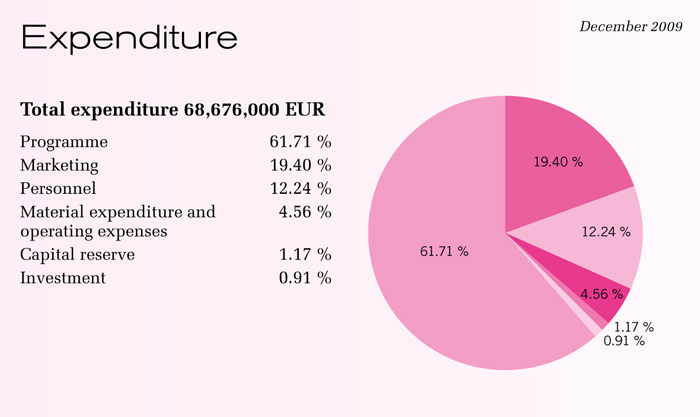 Additional sponsoring contributed around 10.5 million euro to the budget of Linz09, which included around 6.5 million euros worth of contributions in kind (services, advertising, non-cash benefits). 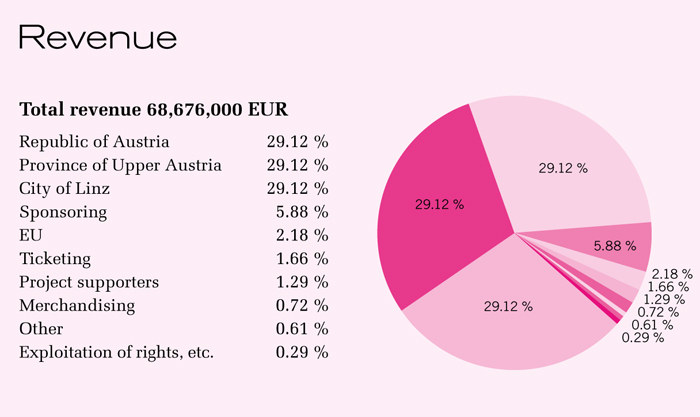 Ticketing and merchandising yielded 1.8 million euro. More than 60% of the total budget was earmarked for Programming. Around 19% was assigned to the promotion of the Culture Capital and to marketing activities, which was significantly more than the 12% originally budgeted for this purpose. As its statement of revenues and expenditures shows, Linz09 not only broke even but carried over significant cash reserves to 2010.